The Group Managing Director, Nigeria National Petroleum Corporation (NNPC), Dr Maikanti Baru, says no new gas project will be approved without zero gas flare modalities. Baru disclosed this in a statement issued by the NNPC in Abuja on Tuesday. He gave the assurance when he received the national leadership of Host Communities of Nigeria (HOSTCOM) led by its National chairman, Chief Benjamin Tamaranebi. He said that the corporation was committed to a zero gas flare regime for every new gas project. He added that NNPC was working on commercialising existing gas flare projects for the benefits of the host communities and the country at large. He assured HOSTCOM that NNPC would partner the various host communities to enable them benefit from exploitation of the nation’s hydrocarbon resources. 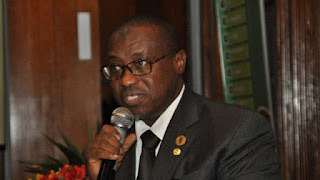 “For already existing gas flare projects, the NNPC is exploring various options to commercialise the gas flare with a view to eliminating it,” he said. Baru commended HOSTCOM for restoring sanity to the Niger Delta region, saying the relative peace has allowed operators to concentrate on production for the benefit of the national economy. “I want to thank the Oba of Benin for midwifing HOSTCOM and the traditional rulers of Oil Mineral Producing Communities of Nigeria (TROMCON). “For us as operators, we will continue to dialogue with the bodies so as to create enabling operating environment for the business and for the communities,” Baru added. He urged HOSTCOM, as a pan cultural organisation, to partner with NNPC in stemming the incessant pipeline vandalism, illegal refineries and illegal crude oil bunkering in the Niger Delta. “The elimination of those vices would reduce to the barest level, incidences of environmental pollution,” he said. Baru noted that the clean-up of Ogoniland had commenced in earnest with the release of the first tranche of the funding for the project since last year. He added that HOSTCOM should ensure the environment, water and aquatic animals of the region are not impacted negatively by illegal bunkering and breaking of petroleum products pipelines. He said that the Oil and Gas business was a global business hence HOSTCOM should provide hospitable environment that would encourage investors to continue to prefer Nigeria to other investment destinations in Africa. Earlier, Tamaranebi, thanked President Muhammadu Buhari and Baru for always granting host communities a listening ear, assuring that HOSTCOM and TROMCON would continue to collaborate with the Federal Government for the common good of all. He commended the Federal government for the ongoing clean-up of Ogoniland, while urging that other communities with similar challenges should be cleaned up as well as for the well-being of members of such communities.